What Ben says is certainly true, and this seems a very natural innovation in the scaling of microfinance. But I wonder whether removing the face to face interaction, similarly to removing the perceived certainty of refinance (which just happened during the crisis), would (likewise) adversely impact the incentive structure of microloans? I’d love to see this work, it would be a major success, but we’ll have to see how it pans out for CreditSMS. The mobile in my view is the most effective gadget in Africa right now. The percentage of people with mobile phones has increased with a big margin in the last few years and this is a good focus for use of the mobile to deliver services and save time, this is a great project. I like the directory as well and I think this is a really viable project. Good work. Great idea. I’d love to see it work. 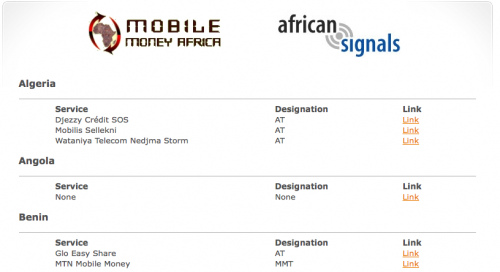 Anyone know if the Mobile Money Transfer Directory worked? The link here takes me to creditsms.com so may be a bit dated. I’m looking for a one stop resource showcasing the mobile money transfer solutions available in different countries on the continent.